While all the headlines today have been about TE Aaron Hernadez being charged with murder, there’s a case with the Browns that threw them for a curveball about attempted murder. The team parted ways with undrafted rookie defensive lineman Ausar Walcott after he was charged with attempted murder Tuesday. Walcott was arrested after punching a man in the head outside a bar at 3 a.m. Sunday in Passaic, N.J., according to reports. 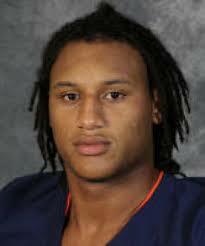 The 23-year-old was signed by the Browns as free agent out of Virginia on May 13 after a tryout with the club. The Browns at 12:35 p.m. today released a statement saying that Walcott had been cut from the team. Detective Andrew White of the Passaic Police told The Record in New Jersey that the victim, Derrick Jones, 24, was taken to a Manhattan hospital after the assault, where he remains in critical condition. Walcott was not participating in the NFL rookie symposium in Cleveland this week because it is only for drafted rookies. The new players are listening to cautionary tales from some of the league’s former troubled players such as Adam “Pacman” Jones and former Ohio State star Maurice Clarett. Subscribe to Browns Gab via RSS Feed or E-mail and receive daily news updates from us! So many of these guys don’t learn how to act like normal human beings until they are way into their 30’s, but by then they are already broke or serving a long prison sentence ! Are the Browns a Darkhorse to Win Super Bowl LIV Next February? Sign up to receive our daily Browns Gab newsletter, and keep up to date with all the latest Cleveland Browns news. Celebrity Seats has all the best Cleveland Browns Tickets, Cleveland Indians Tickets, and Cleveland Cavaliers Tickets!